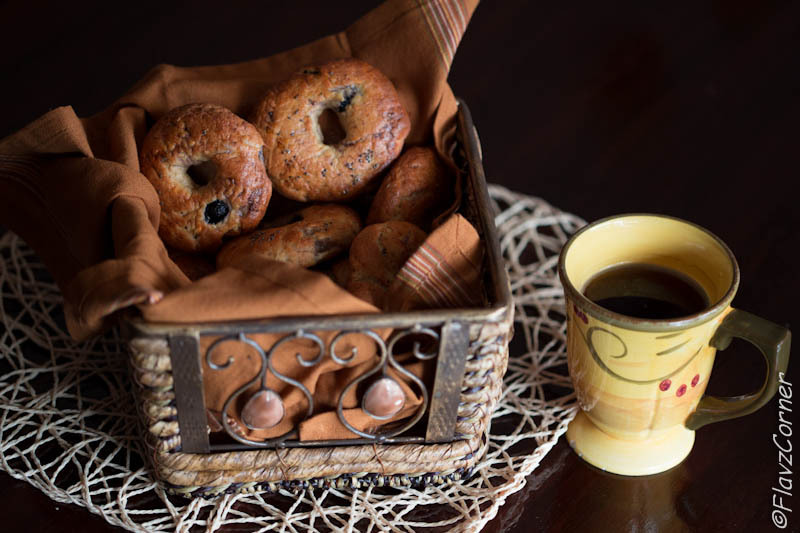 Bagels were invented earlier in the 16th century in Krakow in Poland and was known as 'Bajgiel'. By the beginning of 17th century, it became a staple of Polish and Slavic national diet. 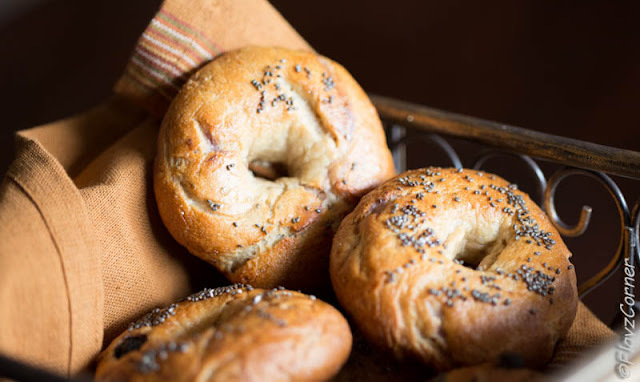 Bagels crossed their fame and were brought to United States by the immigrant Polish community during 19th century. Since then it became an inevitable part of North American diet. Plain bagels were my quick breakfast when I started my first job in US. We used to get bagels on the weekends for the whole week. Both Bruegger's bagels and Panera bagels are my favorite bagels. My taste buds had changed tremendously over these years and I love different variations opposed to the plain bagels now. A warm lightly toasted bagel with some light hazelnut honey cream cheese is an easy breezy breakfast I rely on busy mornings. I had been thinking of making the bagels for a long time, but always put the idea into back burner for some reason. I know exactly what you just thought now....if I can get these bagels at coffee shop around the corner of the street, why hurdle with the dough and all the mess? Did I read your mind? Anyhow, to me it is simply the pleasure to make something from scratch and another appeasing fact I see in homemade food is that I can make it healthier and vary the ingredients according to my family's palate. Do experiment with different topping that you prefer. Mix 1/4 cup of warm water, salt, sugar and yeast in a bowl and wait for 10 minutes till its frothy. Knead the dough using the wheat flour, chia seeds, flax seeds, yeast mixture and rest of the warm water. 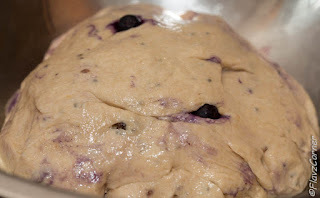 Gently fold in the blue berries to the dough. Transfer to a oil coated bowl and roll 12 equal size balls out of the dough. Press each ball on a floured board till it flattens little bit. Use your finger to make a hole in the middle of the ball and try to stretch the hole to form a ring of dough. Place the shaped dough rings on a greased baking sheet and let it rise for another 10 minutes. 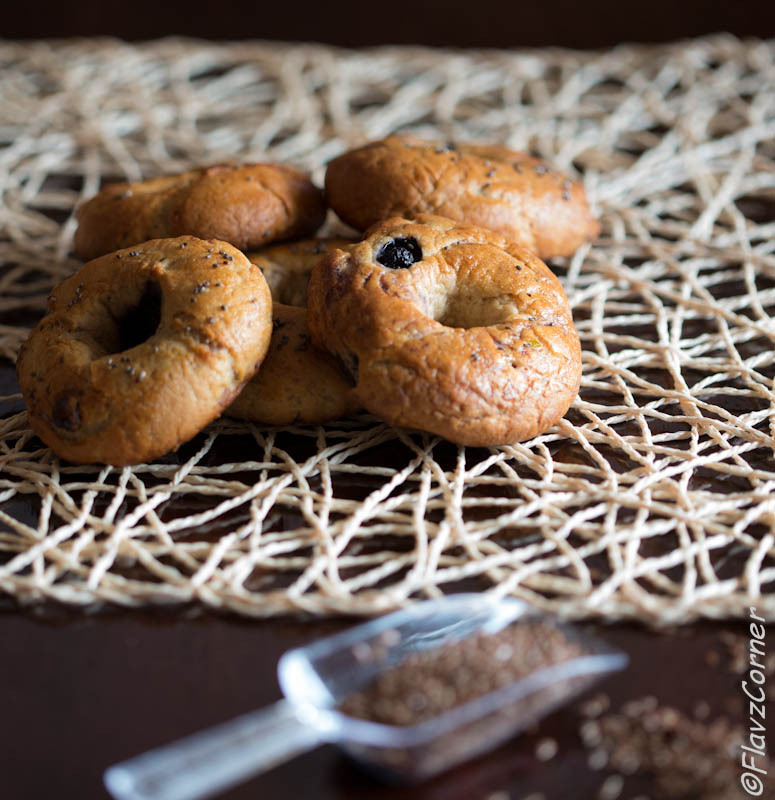 Bring a pot with 3 cups of water + 1 tbsp of sugar to boil and add one bagel at a time and let it cook for 1 minute. Flip the bagel and cook for another minute. The bagel will float in the water. Take them out of water and place it on the baking sheet. Beat the egg white and water together and brush it on the bagel. Sprinkle the chia seeds and bake it for 12 - 14 mins or till golden brown. You can use minced onions, minced garlic, Asiago cheese, cranberry, brown sugar, cinnamon and raisins as other toppings. I used fresh fresh blue berries. If you are using dried blue berries, you can mix it with the dry ingredient before kneading. 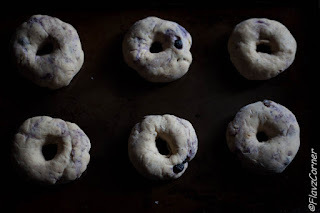 You can make the dough previous night and refrigerate and bake it for breakfast the next morning. The wheat flour can be substituted with all purpose flour and adjust the size of the bagel as you prefer. Love the first pic Shibi...These bagels look so good.. YUM!! !